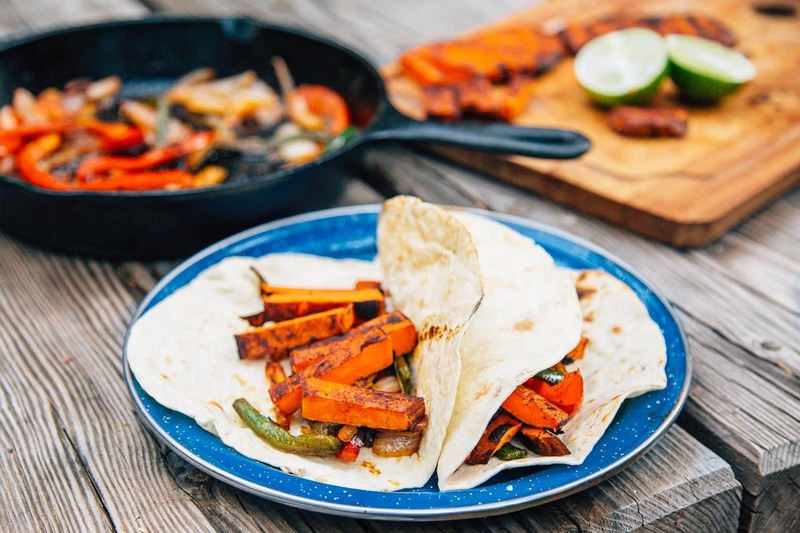 Grilled sweet potato “steaks”, roasted peppers and onions, and a New Mexican chile marinade, these vegan campfire fajitas are a new take on an old classic. 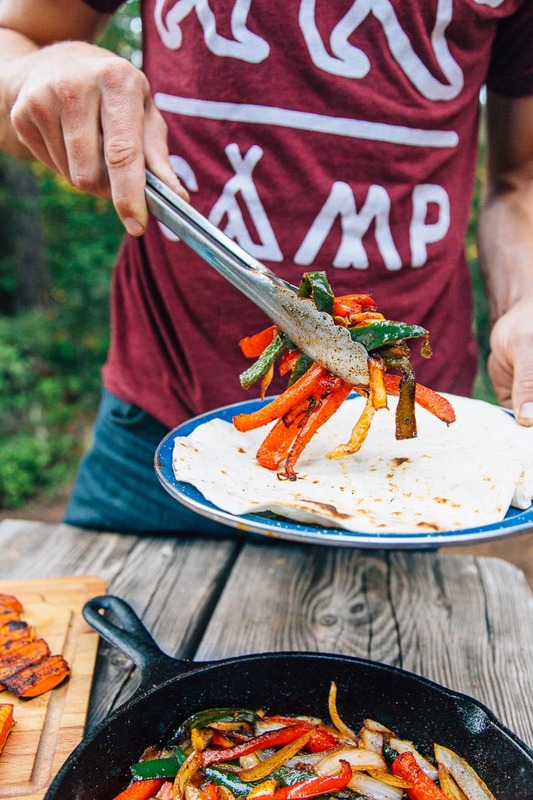 We made this recipe earlier this summer for the Good Company Journal while camping at Timothy Lake, near Mt. Hood, OR. It’s an absolutely stunning location, surrounded by towering pines forests, crystal clear water, and beautiful vistas of snow-capped Mt. Hood. 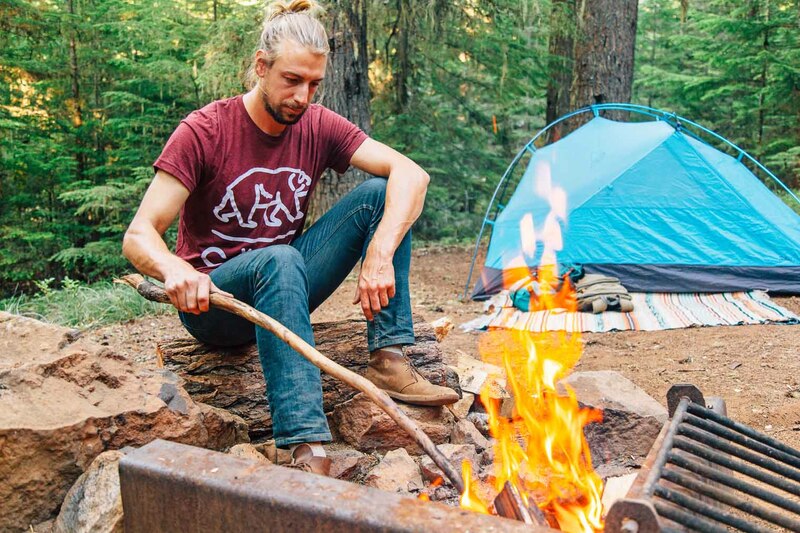 It’s the type of campground you could spend an entire week at (or even all summer.) The only downside is that there are very few places to pick up groceries once you’re out there. You basically would need to drive all the way back into Portland, a roughly 2-hour drive in order to fully resupply. So before we left Portland, we did a big grocery run to stock up. We already had a hankering for fajitas – perhaps induced by one of the many intoxicating food trucks we had passed earlier in the day – so we definitely wanted to make that happen. 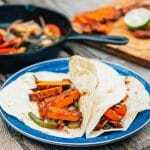 Since we don’t travel with a cooler we started thinking up ways of doing fajitas without using highly perishable ingredients such as meat. The solution? Thinly cut, marinated sweet potato steaks! There are some recipes we know will work. And then there are some that are educated guesses. We definitely were taking somewhat of a risk with this one, since we had never tried it before, but we were confident it would turn out. 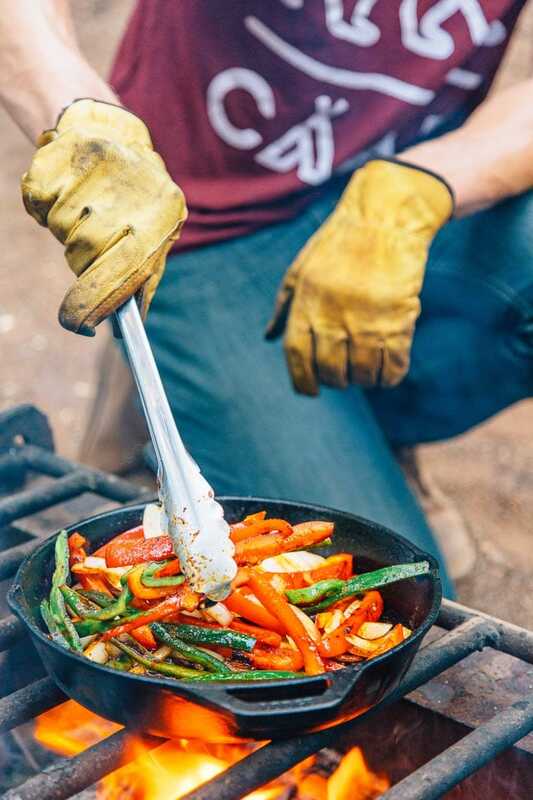 At the campsite, we mixed together our marinade of olive oil, New Mexican chile powder, cumin, and salt. We then sliced the sweet potatoes lengthwise into a roughly ¼ inch steaks, coated them with the marinade, and then let them sit while we got the campfire started. After the fire had settled down and we had some nice embers to work with, we sliced up the peppers and onions, tossed them into a cast iron skillet with some olive oil, and placed them on the heat. Then we placed the sweet potato steaks on top of the metal grate. We flipped them once after about 5 minutes and when they started to feel soft in the middle, we took them off. As soon as we got our first taste test of the sweet potatoes we were convinced. This was going to be a hit. The skin on the edges had been crisped by the fire, the insides had chewy yet firm texture, and the grill marks gave them a delicious BBQ charred flavor. Without delay, we sliced up the rest of the steaks widthwise into strips and prepared to serve while they were still warm. 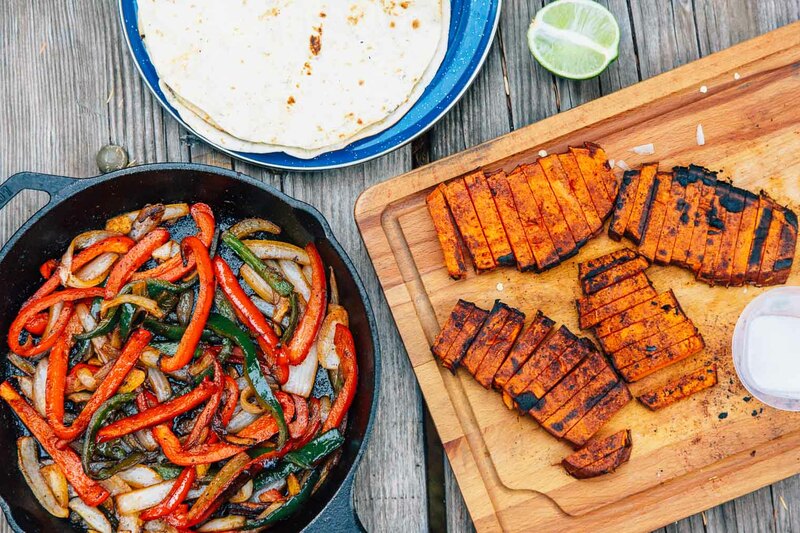 Right before we were going to start building our fajitas, we pulled the onion and peppers off the grill and placed the skillet on the picnic table (because it’s just not fajitas without some dramatic sizzling skillet nearby). The end result was killer. 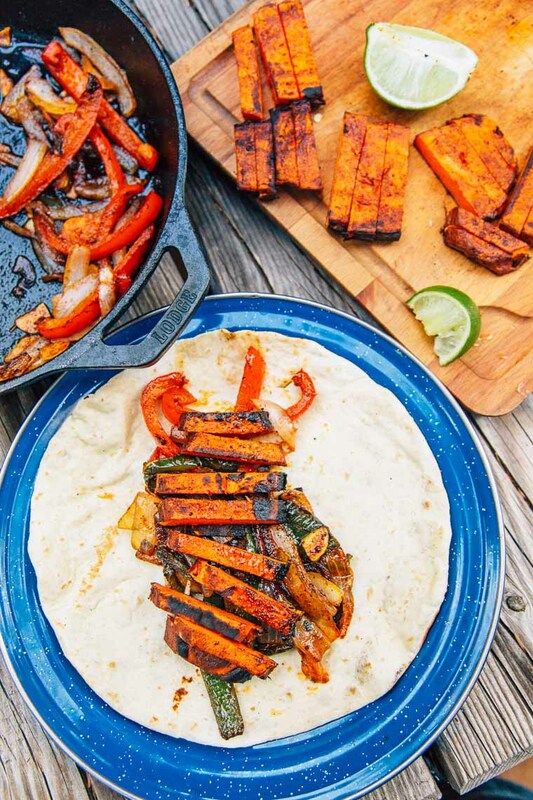 Grilled veggies, charred sweet potato, and loads of southwestern flavor. It was everything we want from fajitas. And since all the ingredients are pretty long lasting, we could have easily made this on day 1 or day 7 of our camping trip. 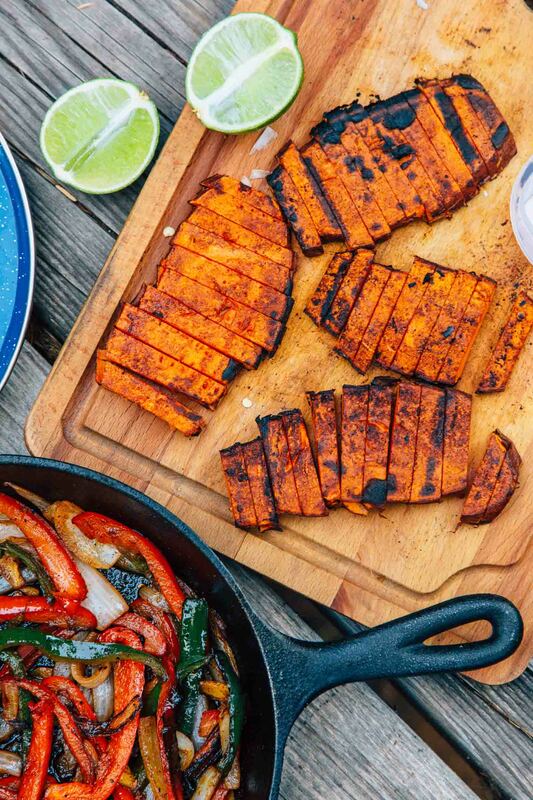 So for your next fajita night, try skipping the meat and go for a nice grilled sweet potato instead. 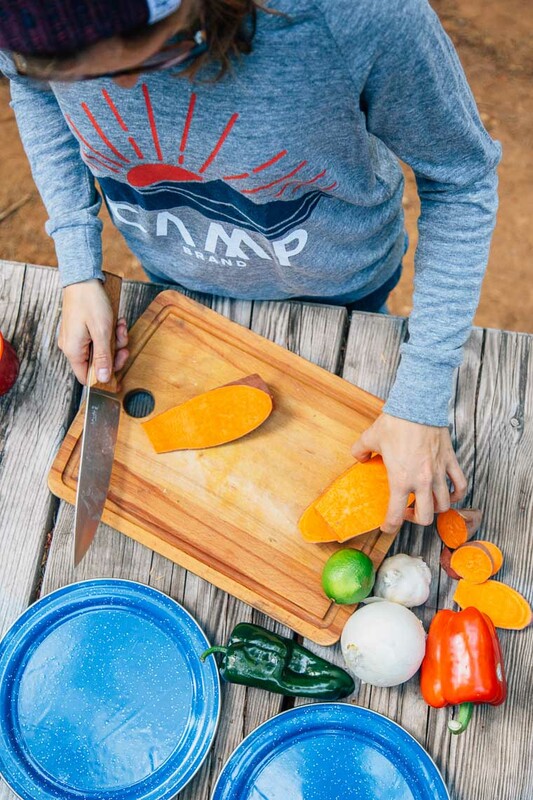 To save time at your campsite, you can cut and marinade the sweet potatoes at home and pack them in an airtight container or bag in your cooler. PREP & MARINATE THE SWEET POTATO "STEAKS": Cut both ends off the sweet potato. 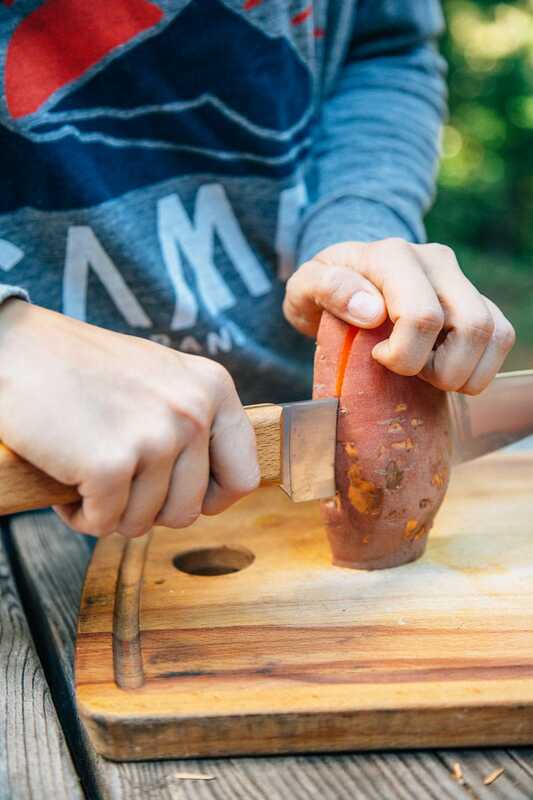 Place the sweet potato vertically on your cutting board and slice downwards to create 4 or so ½ inch slabs. Prepare the marinade by mixing the oil, liquid aminos, chile powder, and salt together in a small container. Lay the sweet potato on a large plate and drizzle half the marinade over the top, using the back of a spoon if needed to evenly coat. Flip the sweet potato and repeat on the other side. Set aside and let marinate for at least 20 minutes. PREP VEGGIES: Meanwhile, slice up all the vegetables. De-stem and deseed the peppers and cut into long strips. Chop the onion into ¼” wide slices. Chop the garlic. 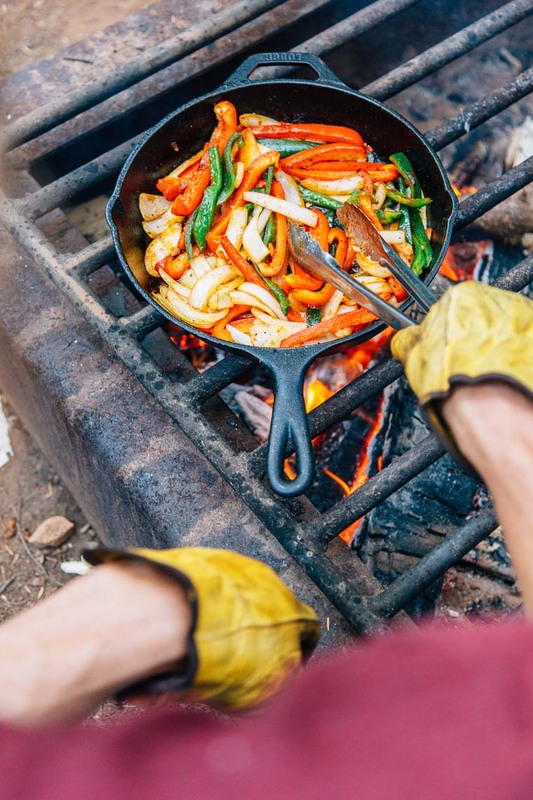 COOK THE VEGGIES: Over your campfire, heat 2 tablespoons oil in a cast iron skillet. Once hot, add the peppers and onion. Sauté over high heat until they soften, then add the garlic and spices. Continue to cook until the vegetables are soft and the onion is just beginning to brown - about 15-20 minutes total. COOK THE SWEET POTATOES: Right after you get the vegetables going in the skillet, place the sweet potatoes on the grill (you could also cook them in a second cast iron if you’re not cooking over a campfire). Cook on one side for 5 minutes, then flip and cook the other side for 5 minutes. Once they are tender throughout (but not mushy! ), pull them off the fire and slice into ¼” slices. TOAST THE TORTILLAS over the fire, about 15-20 seconds per side. 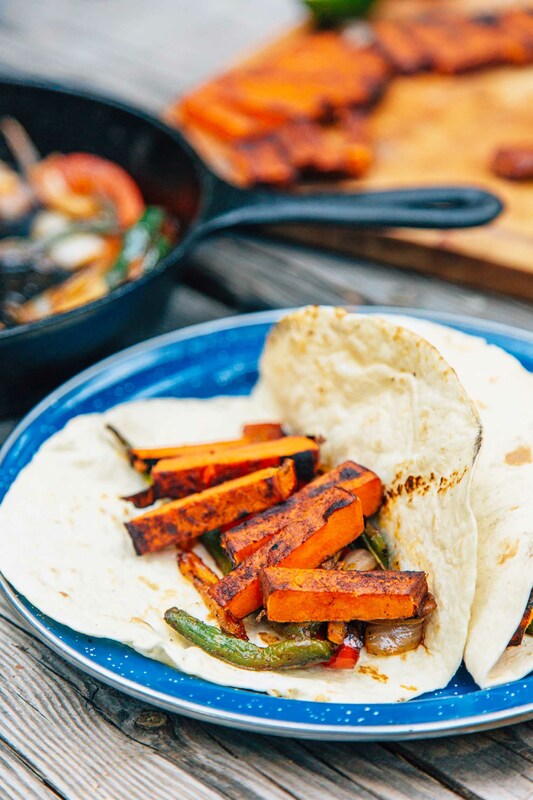 TO ASSEMBLE: place a scoop of the vegetables onto a tortilla. Add the sweet potatoes on top, and finish with a squeeze of lime. Repeat for the other fajitas. Dig in! This recipe originally appeared on Camp Brand Goods’ Good Company Journal. 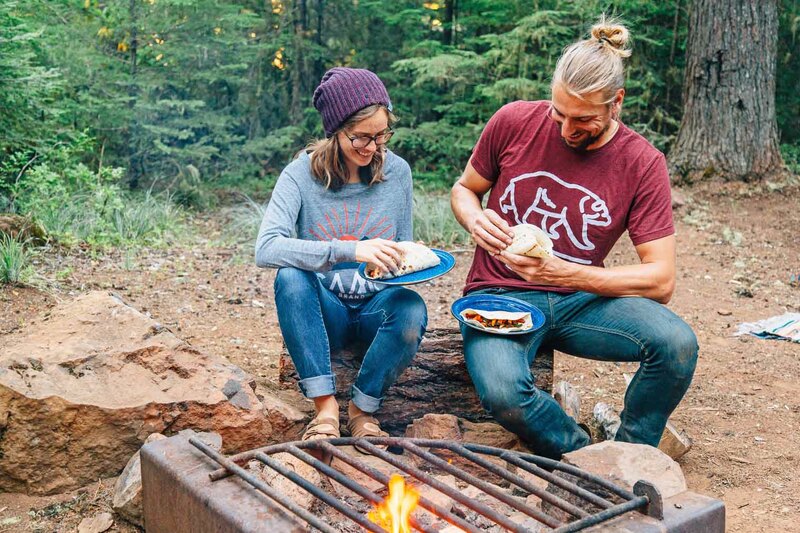 You can check out their outdoor lifestyle apparel here. this looks delish! omg forreals. Do you mind if I add this recipe to my blog? I’m creating a new series called #meatlessmonday inspo. Obvi I didn’t coin the term meatless monday, but I do want to inspire my readers. These look so good that I’m going to have to make them for dinner this week–from home, not over a camp fire, unfortunately. I would totally make this at home, not even camping. Looks yum, you guys! Yum, these look so good! I may just have to make them at home and pretend I’m in the great outdoors!